Environmental systems can be realistically described by mathematical and numerical models of the system dynamics. These models can be used to predict the future behaviour of the system, provided that the initial states of the system are known. Complete data defining all of the states of a system at a specific time are, however, rarely available. Moreover, both the models and the available initial data contain inaccuracies and random noise that can lead to significant differences between the predicted states and the actual states of the system. In this case, observations of the system over time can be incorporated into the model equations to derive “improved” estimates of the states and also to provide information about the “uncertainty” in the estimates. Griffith, A.K., 1997. 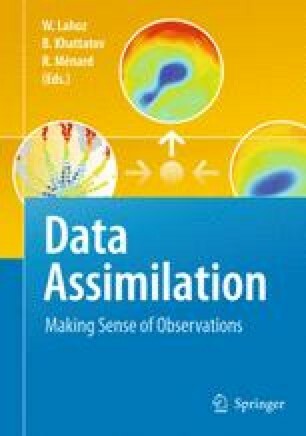 Data Assimilation for Numerical Weather Prediction Using Control Theory, The University of Reading, Department of Mathematics, PhD Thesis. http://www.reading.ac.uk/maths/research/maths-phdtheses.asp#1997. Katz, D., 2007. The application of PV-based control variable transformations in variational data assimilation, PhD Thesis, Department of Mathematics, University of Reading. http://www.reading.ac.uk/maths/research/maths-phdtheses.asp#2007. Martin, M.J., 2001. Data Assimilation in Ocean Circulation Models with Systematic Errors, The University of Reading, Department of Mathematics, PhD Thesis. http://www.reading.ac.uk/maths/research/maths-phdtheses.asp#2001.